Peony Love. Let me introduce you to Peony Love. These beautiful flowers exist in a fantasy. Each with tentacle like petals...He reaches to meet his true love's blossom for a romantic embrace. The third piece from my new Art Nouveau inspired collection. 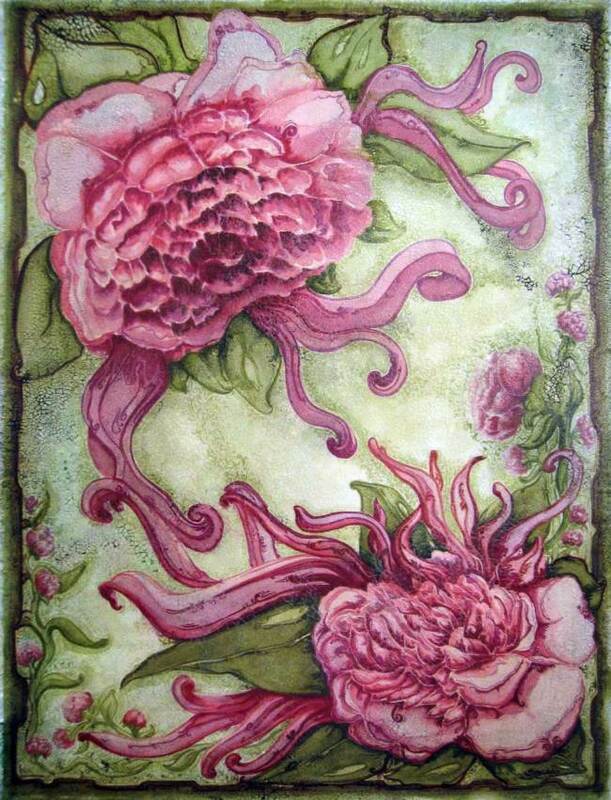 This piece was created using a variety of media in a multi-step process that begins on paper and ends with a glaze over an unevenly cracked surface. The result is a lovely delicate vintage look that is reminiscent of porcelain. The process is so intense that I risk destroying the art with my application of the final few steps. It's worth the risk! The result is Art Nouveau eye candy that transports you back in time to the romantic Victorian Era when all things feminine thrived. Sold.